The additive manufacturing (AM) process is used to produce an entirely porous implant that mimics the structure of cancellous bone. Global medical technology business Smith & Nephew has developed a 3D printed titanium implant which could replace other porous implants. 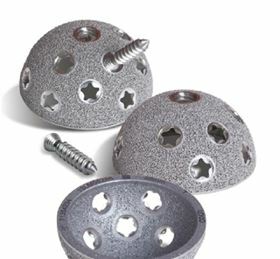 The Redapt Revision acetabular (pelvic) fully porous cup is designed for use in revision cases where compromised bone makes implant fixation and stability more difficult. To allow ingrowth, the additive manufacturing (AM) process is used to produce an entirely porous implant that mimics the structure of cancellous bone. The technology used is an alternative to external porous coatings, such as sintered beads or fiber mesh used in other uncemented implants, to allow bone ingrowth securing the implant in place. The process used to build each new Redapt cup begins by precisely aiming a laser onto a thin layer of titanium (Ti-6Al-4V) powder. The heat generated by the laser fuses the powder together. Solid reinforcements can be built directly into the porous structure to provide extra strength in precise locations. This story uses material from Smith & Nephew, with editorial changes made by Materials Today. The views expressed in this article do not necessarily represent those of Elsevier. A highly porous ceramic foam ink helps control structure of 3D printed materials.